Sony announced the PSP2 this morning, and you may be curious to see all the wonderful features and specification of the new portable console. Below is the complete fact sheet as released by Sony, detailing the console inside and out. As the rumors suggested, Sony has announced the next iteration of its portable PlayStation Console. Codenamed NGP, for Next Generation Portable, the console is designed to offer unparalleled interactive entertainment that is only possible on PlayStation. This new system offers a revolutionary combination of rich gaming and social connectivity within a real world context, made possible by leveraging SCE’s experience from both PSP and PS3. The latest edition of magazine PSM3 has some very interesting mockups of what the PSP2 may look like. These could be real images or they could be PSM3’s representation of what the next iteration of the PSP will look like. Check out the high-res images below to read the interesting parts of the article. Rumor Alert: PSP2 Announcement at E3? If last year was anything to go by (when the PSPgo was announced), Sony could be prepping another big announcement for the PSP. According to MVC, a number of publishers are waiting for an announcement of the next iteration of the PSP before announcing their games line-up for the portable console. Rumors indicate that Sony is still working on a new PSP model even with the release of the PSPGo only months away. Eurogamer.es is claiming to have insider sources who say that the PSP2 will have a quad-core graphics chip. This is reportedly a quad-core version of the low-power SGX543MP chip, codenamed “Hydra”. Of course, this cannot be confirmed as Sony hasn’t even announced a new model yet. 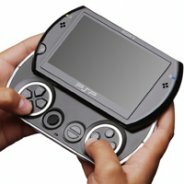 The hardware specification and design for the new PSP model, the PSP Go, have been leaked ahead of Sony’s E3 announcement. VG247 got hold of a Qore video (see below) that was supposed to be posted on the US version of PSN immediately after the platform holder’s E3 presentation. Sony’s senior product manager John Koller is seen discussing the new machine – there’s even mention of a brand new Metal Gear Solid title for the handheld, too. The rumor mill has been running overtime this week with information on what the PSP2 will contain. One of the more convincing rumors has revealed some interesting information from a supposed “inside source”. According to this source, the PSP2 will be called “PSP Go!”, in line with the range of services already offered on the PSP ( Go!Cam, Go!Explore etc). More details on the new PSP model should be revealed at E3 in June, and the new model is expected to launch towards the end of this year. The UMD is finally about to bite the dust, according to David Perry of Shiny Entertainment. In a twitter update, Perry said “Sony finally removed the stupid battery-sucking UMD disc drive”. Of course, this hasn’t been confirmed by Sony so place it under the rumor category for now. In related developments, the PSP2 is indeed real according to Perry once again. He states that a developer he knows is currently working on it right now, which leads us to believe that prototypes are already available.